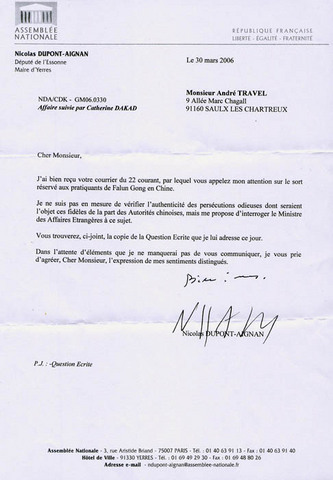 Recently, Falun Gong practitioners have been writing to the MP of the Esson area and the Mayor of Yerres city Mr. Nicolas Dupont-Aignan to tell them about the CCP's savage persecution of Falun Gong practitioners. 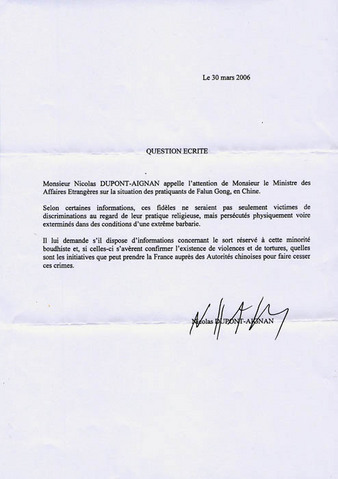 Subsequently, Mr. Dupont-Aignan wrote a letter to the French Minister for Foreign Affairs, appealing to the French authorities to take immediate action to stop these crimes. I received your letter on the 22nd of this month, and you drew my attention to the suffering of Falun Gong practitioners in China. I am unable to confirm the validity of the horrible tortures used by the Chinese government to torment these believers, but I am however to enquire of the Foreign Minister about this. Attached is a copy of the letter I wrote to the Foreign Minister. If there is any more news I will definitely inform you. Please accept my highest esteem and respect. Mr. Nicolas Dupont-Aignan asked the Foreign Minister to pay attention to the situation of Falun Gong practitioners in China. I have heard that these believers, because of their religious faith, are not only prejudiced and discriminated against, but are also suffering physical torture and persecution and are even brutally slaughtered under extremely inhumane conditions. I am writing to ask you, the Foreign Minister, whether you have any information about the fate of this Buddhist practice. If this information can establish the existence of this violent torture, then may I ask what action France could take against the Chinese authorities to stop these crimes.